After work stopped on the difference engine around 1834, Babbage began to think about generalizing the machine to handle a wider class of calculations. After a very rapid period of development he had, by 1837, a fairly complete set of plans for a machine he called the Analytical Engine. 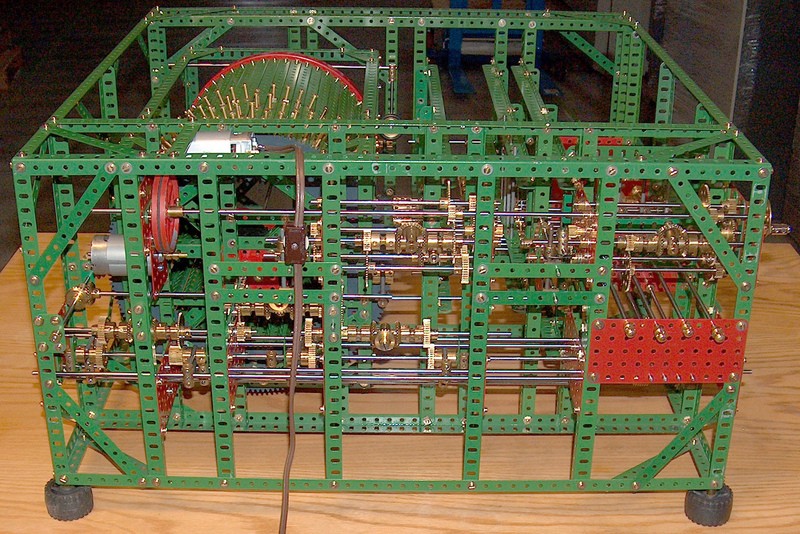 This machine was vastly more complex than the Difference Engine and incorporated many of the features of modern digital computers. Babbage continued work on refining and simplifying the Analytical Engine until about 1857, though he made no attempt to physically construct it. After a break of many years, he returned to it in later life, mostly working on manufacturing techniques that might have allowed a simplified version to be constructed. At his death only a small fragment was completed. His youngest son Henry picked up the work for a time, and in 1910 demonstrated a working portion of the mill and printing apparatus. Both these items are preserved in the Science Museum in London. Unlike the Difference engines, for which Babbage left fairly complete and mature designs, the Analytical Engine was always a work in progress and evolved enormously in implementation detail over the years. One aspect which remained fairly constant however was Babbage's proposal for the control mechanism. This consisted of a set of "barrels" on which control information was encoded by projecting studs (similar to the barrel of a musical box). In modern terminology we would call the barrel a micro program store. Babbage had facilities for conditional branching, including multi-way branching. Although the design of the barrels evolved very little, as far as is known, neither Babbage nor his son ever attempted to construct one - perhaps because they felt this aspect of the design was secure. 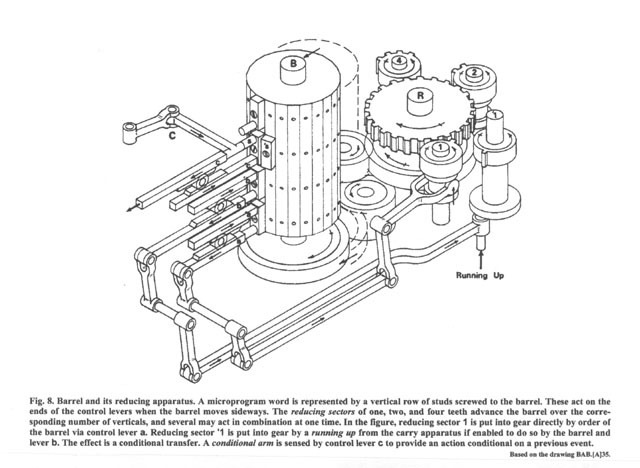 This diagram, taken from Bromley (1982) illustrates the principle of the control barrel. Pictured below is my attempt to construct a demonstration model of one of the barrels from Meccano. It operates reliably and there can be no doubt Babbage's concept would have worked. Practical considerations of Meccano meant my barrel is horizontal and the "reducing apparatus" uses differentials in place of Babbage's sectors with various numbers of teeth, but these are minor implementation details.